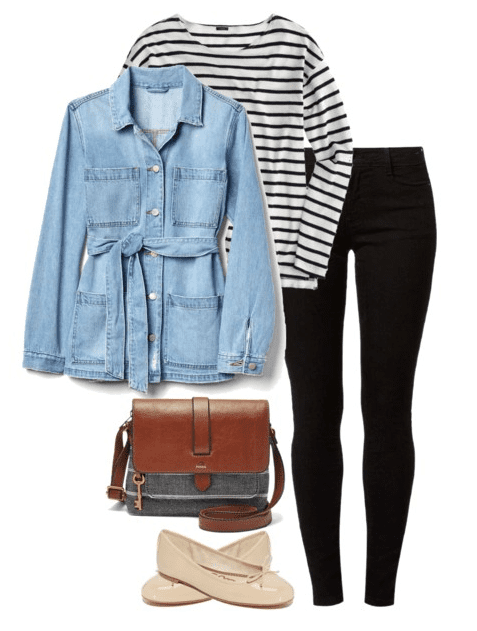 6 Denim Jacket Outfit Ideas for Spring – The denim jacket is a versatile piece to have in your wardrobe and can be worn from season to season. I love the way a denim jacket looks with white jeans. It’s a crisp, clean, minimal look for spring and one you can trust to be your go-to when you’re in a rush. Just about any colored tee would work for this outfit. My favorites are the gray tee pictured here, a soft pink tee like this one, a classic black tee or an off white tee. 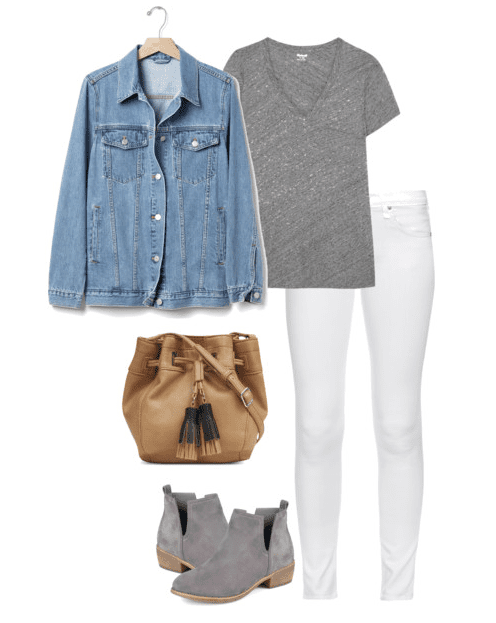 This look is perfect for the weekend whether you’re running errands or traveling around exploring a new city. You can’t go wrong with denim and stripes. It’s an outfit formula that works and one I like to include in my wardrobe rotation. At first, I styled this outfit with white Converse, which looks great and is an outfit I’ve personally worn numerous times. But I wanted to show you how you can change something as easy as your footwear to get a different look. By adding a classic ballet flat, it gives this look a more feminine feel, which I love. You could also swap out the ballet flats for black sandals like these or ankle boots like these if the weather is still a bit on the cool side. Here’s a different take on the classic black and white stripes and denim look. Pair a denim jacket with a black maxi skirt and a white classic scoop neck t-shirt. All you need is a great pair of sandals, a fabulous black handbag, possibly a statement necklace if you’re into that kind of thing and you’re good to go. This outfit also well works for all body types. Here’s a good look to pack for traveling this spring and summer. Wear the Converse while you’re out and about seeing the sites during the day and then swap them out for a cute pair of sandals for a casual dinner that night. I have a dress just like this one and it’s incredibly comfortable, doesn’t wrinkle easily and takes up almost zero space in my suitcase. 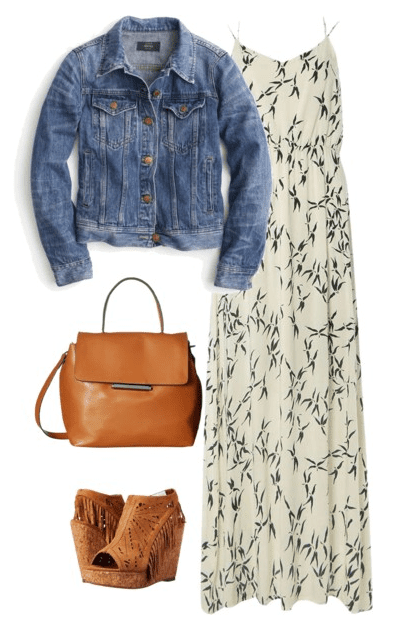 Throw a denim jacket on over your favorite floral maxi dress for a laid-back boho vibe. This is also a great way to wear that maxi dress that may show a little more than you’re comfortable with, but you still love the pattern. A maxi dress is a perfect way to step out of your shorts and jeans rut you may be in. Most maxi dresses are a little long on me, so I wear a wedge sandal as opposed to a flat sandal. Add your favorite handbag and you have one fantastic outfit for spring get-togethers or a casual date night. 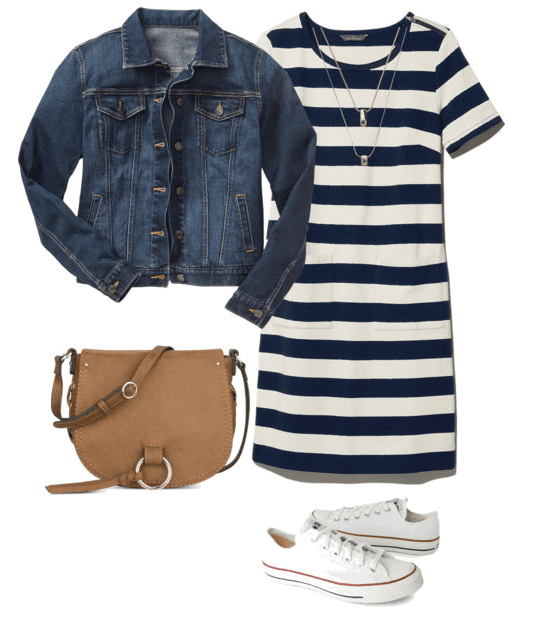 After I put together this denim outfit idea, I added, “find a pleated midi skirt” to my wish list. I fell in love with this outfit. 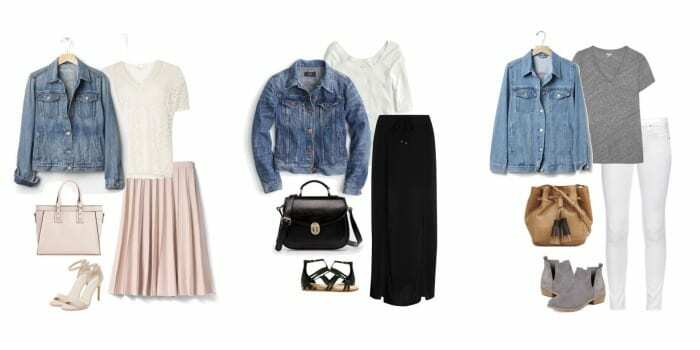 The midi skirt and the lace top + the heels are so feminine and the denim jacket adds a touch of edge that is just perfect and a little bit unexpected. A great outfit for a sunny spring day. I love these options. I will have to try a few come spring! 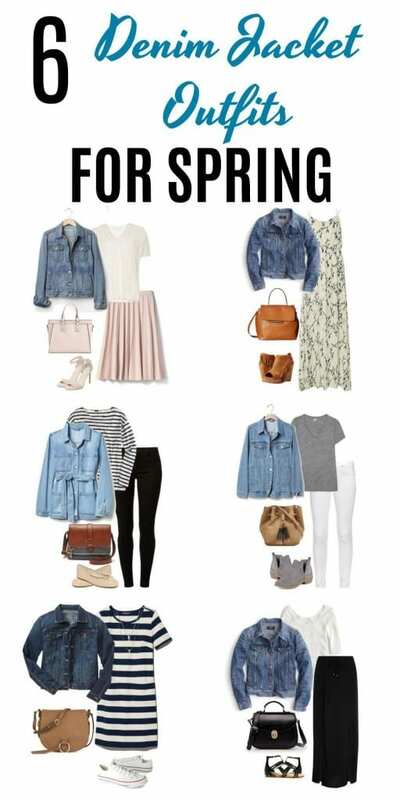 I love the way you styled these denim jacket looks! I want to wear them all! Such a cute outfit selection! I have always been a denim jacket kind of girl… I’m glad I’m back in style again! Pinned for you!